Hollywood loves to make adaptations. It loves adaptations of television shows, books, video games, author's lives, etc. The recent rage in adaptations appears to be board games. This summer the first of many board game based movies was released in the form of Battleship. The duo that directed Alvin and the Chipmunks will be directing an adaptation of Candyland. A movie adaption of Monopoly is supposed to be about the sub prime mortgage crisis and finally a low budget adaption of Ouija will round out the board game movies. I could care less about the other movies, but the Ouija Board is always interesting in movies and it has been in many horror movies. It has already been the primary focus of a Filipino horror film called Ouija. From the Exorcist to Paranormal Activity the Ouija Board has brought doom on the masses, but is it really as evil as it is in the movies? The Ouija Board was first created during the spiritualist movement of the late nineteenth century. It was designed as a tool to help communication with spirits. Elijah Bond and Charles Kennard were the first to patent the device. In 1966, the device's patent was sold to Parker Brother's who still own it. Ever since its creation the Ouija Board has been controversial. The most famous case of demonic activity with Ouija Board was the case that was later the inspiration for a book The Exorcist. I've blogged about this case before. A little boy named Robbie and his aunt attempted to contact a deceased relative and the resulting demon possession was legendary. I remember my first experience with the Ouija Board was fairly typical. I was at a slumber party and one of the girl's brought out the board. We all took turns asking questions. I can't remember them all. They were mundane girly questions like "will Billy Bob ask me to the dance," or "Will I be a doctor when I grow up." At the end, the girl who brought the board out told the spirit thank you and said that she would give it all her Halloween candy as a way of saying thank you for all its help. She put her bucket of Halloween candy by the board and we went upstairs to play light as a feather stiff as a board. When we returned, all the candy was gone. The wrappers were still there. They were still sealed, but the candy was gone. I'll admit, this could be some kind of slumber party prank, but I don't know how this girl, who was pretty clueless pulled it off. Almost everyone you talk to has a Ouija board story and almost all of them are bad. Mine was quiet and stupid, but almost everyone I talk to about the board agrees that it opens doors that shouldn't be opened. My grandmother passed away a few years ago, which had lead to much contemplation on her life. She was a woman who always dabbled in the supernatural and believed firmly in ghosts. In fact, she had a relationship with a ghost named Alonk that lasted years via the Ouija Board. She forced my mother and her sister to help her continue this relationship. Alonk told her he loved and sent her love stories. It really creeped my mother out, although my aunt grew fond of Alonk. There are a million Ouija Board stories. One local story, involves a teen that used the board regularly. One night the sofa he stored the board under burst into flames, burning down the entire apartment complex he lived in. Another story I found in a book, describes a young man's interaction with a spirit via the board. 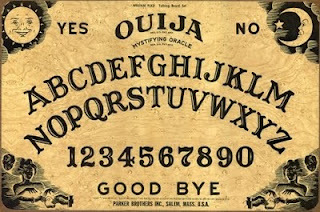 During this interaction, the spirit said the board was specifically designed to communicate with those in hell. Only spirits that had been damned could be contacted using the board. I have heard a few good stories about the board. One woman at a paranormal meeting I went to said she talked with a playful girl spirit that had lived in her house before her. She said the interaction was positive and helped bring peace to herself and her daughter who had been afraid of the ghost before the conversation via the board. I know that some people must be having positive experiences with the board, because it still sells very well. There is even an online version of the game now that allows you to play alone using your mouse. However, the overwhelming bulk of the stories are terrifying. Which brings me to the question. Is the Ouija Board a gateway only to evil or can it be used for good? Are people being swayed by the abundance of negative stories or are there any possible good uses for this tool? Evil is all in the Point of View isn't it Jess?...Which is worse? The vengeful Spirit or The greedy sod looking for where there Late Loved one buried their money...Or Hid The New Copy of the Will...etc etc.. I never had anything weird happen after using a Ouija board but my daughter's friend April did. I actually did some posts on them....weird stuff. I've wanted a Ouija Board for as long as I can remember but a vintage Ouija Board, not a modern remake. The vintage ones go for quite a bit on eBay but I know that one day one will come my way! We used to make our own DIY Ouija Board for when me and my friends went camping when I was a teen - Nothing really ever happened which was a lame.. although one day we did do it in my dads house after his gf said she didn't want us to do it in their house.. obviousl being rebelious teens we went against her wishes! It was just me and two other friends and we asked the usual questions..is anybody there.. how many spirits are there.. what is their name.. how old are they.. blah blah and then glass did move but it spelt out.. BUM .. yes.. bum! My two friends promised me that they didn't push the glass on purpose and I didn't feel any force from either one of them so we assumed it may have been initials, it also nearly spelt out my name.. SAND as my name is Sandy but my dad always calls me Sand. I have asked my best friend recently if she would use it again with me if I do manage to get hold of one and she said she didn't know. I don't see what the big deal is but people are obviously scared of it because of all the movies they have seen that portray it as something evil that shouldn't be messed with.. I just see it as an experiment. I have heard some weird tales but never anything overtly happening directly to me. I shy away mostly. My experiences with one were just frustrating and dumb. My sister was clearly pushing the planchette the 1st time I did it with her. (And asking questions like, "Should Courtney clean her room?" and then making it move to yes. Stupid stuff only a sister could do to another sister to piss her off.) Nothing else happened the other times. I've actually grown not to believe in "the power" of Ouija boards. I don't think they have any or open any doors. I do, however, dig the way they look. Especially the classic ones.